In another thread, Fauvelus posted a great 12th century French capital which is very similar to the Tarot de Marseille devil. Another, less interesting, example is this 16th century (detached) fresco by Bernardino Luini (Satyrs sacrificing to the god Pan). The fresco can currently be seen in the Brera museum in Milan. Fascinating images, Marco, and thanks for the link to the other thread. 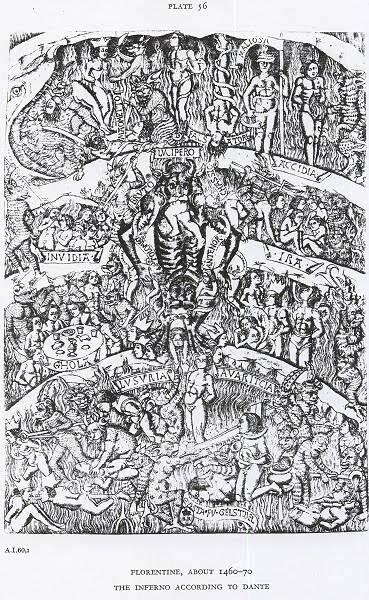 A possible other source for the bound imps of the Marseille Devil card might be the "bound captives" motif in the illustrations of Petrarch's Triumph of Fame. Here is one example, attributed to Pesellino c. 1450, from a cassoni that has illustrations for all six. I took a photo of the black and white illustration in Schuebring's 1927 book on Italian cassoni. Another reproduction, quite small, is at http://www.gardnermuseum.org/collection ... p15e18.asp. In engravings, an example is this one, one of six on the same sheet, which I get from Hind 1938, Early Italian Engravings. He gives no attribution; but Lambert 1998, Les Premieres Gravures Italiennes, calls him "the Master of 1466." In Lorenzo di Medici's birth tray, 1449 (scanned from Syson and Thornton, Objects of Virtue, I see only one captive, lower center, but that is better than none. A question might be, how would the designers of the "Marseille" know about this motif? I don't know; but at least it was more readily available than the image that posted by Marco and Fauvelus; it is also from the time and place the tarot started. Perhaps this motif was used in the "popular tarocchi" of the 15th century, of which we are ignorant. 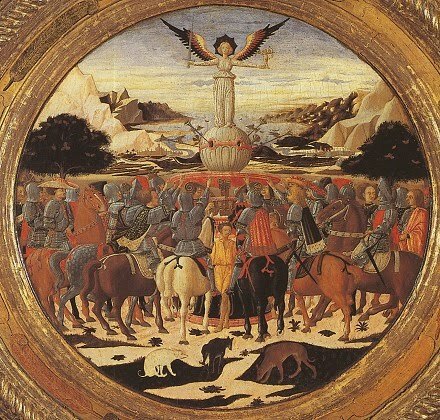 Other triumph motifs were in fact used, such as the Cupid on a pedestal, the scythe-carrying skeleton of Death, and--seen first in the Sforza Castle card--the four animals of the evangelists in front of God or Christ of the Triumph of Eternity. If the two imps are descended from the "captives of Fame," that would put the Triumph of Fame where it should be in the sequence, between Death (13) and Eternity (21), in some hypothetical "popular tarot" imagery which later appeared in the Marseille. That's an interesting comparison, Mike. I have trouble imagining such a reversal of the meaning of the figure, though. The Cary Sheet Devil also looks nothing like this. Just conceptually, in order to imagine illustrations of Petrarch's Fama being the source for the Devil, I have to find the area of overlap of the "semantic range" (or semiotic range?) of "Fame" and "Devil". We might find that in the concepts of vanity, vainglory, hubris, etc. or something like that. But it seems a bit restrictive, and an unlikely inversion. 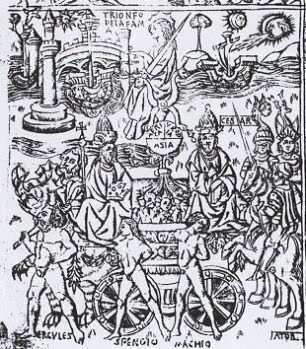 But it is not difficult to imagine where the Tarot de Marseille designers could have seen such an image, since Petrarch's Trionfi were a popular subject in French, in the 16th century. I don't have a selection of French Trionfi engravings on hand to see if a popular version was based on the earlier Florentine ones with the captives, though. Shorr, D. C, "The Identification of the Captives in Petrarch's Triumph of Fame". Die graphischen Künste, NF, Bd. II, S. 41 — 44. Maybe you have access to this article. Okay, found something - "Spendio" and "Machio". Sara Charney, "Artistic Representations of Petrarch's Triumphus Famae", in Konrad Eisenbichler and Amilcare A. Jannucci, eds., Petrarch's Triumphs: Allegory and Spectacle (University of Toronto Italian Studies 4; Doverhouse, 1990), pp. 223-233. Note 27 - D'Essling and Müntz suggest that Spendio and Mahio/Machio are personifications of two vices, possibly of prodigality and of folly. See p. 130. Dorothy Shorr identifies the two men with the historical characters Spendius and Mathos. For a discussion of Shorr's views and facsimiles of the engravings see Arthur M. Hind, Early Italian Engraving ... 1: 35; 2: plates 21 and 24. Hind dates both engravings ca. 1460-1470. They are located in the Albertina, Vienna." The idea of a Diablo with captives is very old. 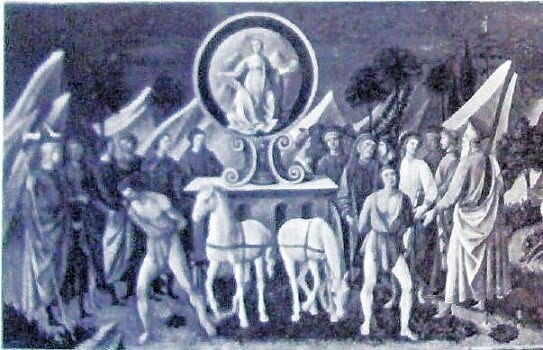 However, it is probable that Petrarch not take this idea here, but of the Roman triumphs, where a train of prisoners followed the victorious general as he entered Rome. 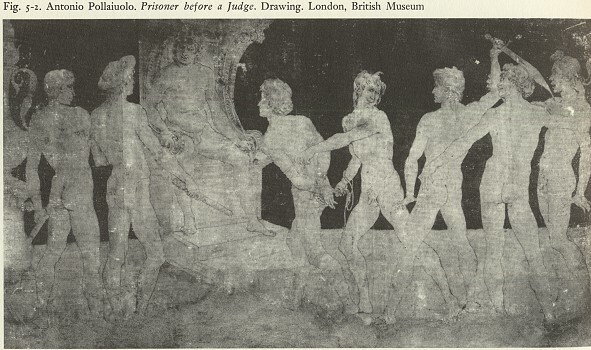 I read somewhere that the two captives were associated with Hercules, who stands next to them in the engraving. They attacked him, and he took them captive, or something like that. I might have read it in Hind. I will check. Yes, I know that Fama as the triumph corresponding to the Devil is a stretch, even an inversion. But in the ordinary sense of "fame," that of being remembered by history, some of those who get fame are often, in the eyes of many, captives of the Devil. Perhaps we should compare the "triumph of fame" engraving I posted with Bosch's "Haywagon," in which an emperor and a pope, among others, follow the parody of a triumphal cart into the abyss (http://commons.wikimedia.org/wiki/File: ... ch_074.jpg). Yes. But I had in mind the specific motif of a figure on a pedestal with two bound figures below it. Here is an example with one captive, an engraving in Hind. If you count the man collared to a stake, there are two, but they are not symmetrical as in the "Fama" engraving and the card. As Ross says, Petrarch does not mention the captives. In the Renaissance and after. 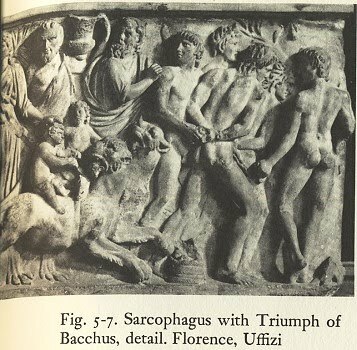 artists probably did see friezes of Roman generals in triumphal procession followed by prisoners; and they could have used them as models. I know of one clear case, from a Roman sarcaphagus. It is not of a Roman victory, however, but of Dionysus returning victorious from India. Levenson et al (Early Italian Engravings from the National Gallery of Art) give us a drawing by Pallaiuolo that they think was influenced by this sarcophagus. Another connection to Dionysus returning from India is the very word "triumph," which comes, as the Renaissance knew, from the Greek Thriambos, the type of hymn sung to Dionysus in procession (see Wikipedia). The first such victory procession, the mythologists said, was that of Dionysus returning from India, complete with the elephants that we see on some versions of the Triumph of Fame. Petrarch doesn't mention the elephants. They were associated with the Roman processions, too (e.g. in Mantegna's "Triumphs of Caesar'). But their association with Dionysus was well known as the first (as declared for example by Cartari, 1551).